DAY 2 Yup, my second day in Bahìa Drake involved lots of marine life, like this sea turtle, which I saw before I even started snorkelling off the coast of Isla del Caño. 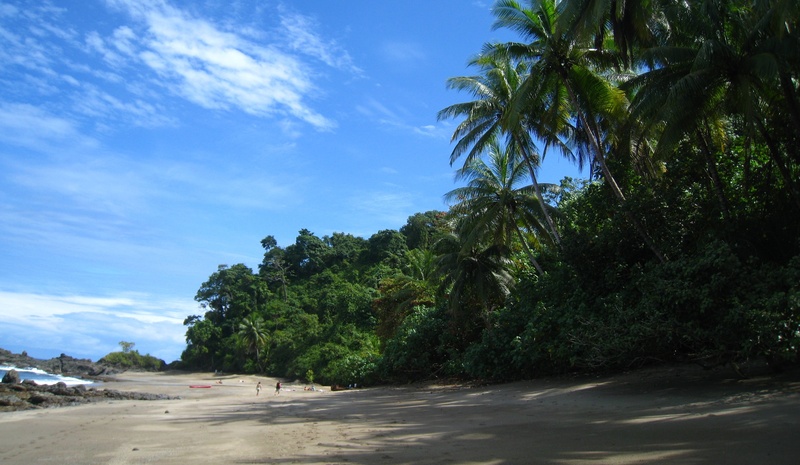 Like the rest of Costa Rica, there’s much to do in Bahìa Drake, and snorkelling is the second most popular activity, after a trip to Corcovado National Park. Too bad I’ve a fear of open water and had only snorkelled once before (in Boracay, Philippines). But determined to make the most of the area, I woke up at dawn, ready to fortify myself with a delicious breakfast of pineapple, mangoes, homemade bread and guava jelly! That’s the awesome thing about Pirate Cove – one of the owners, Suzanne, has a farm, and she goes there daily to harvest whatever fruit are ripe (pineapples, mangoes, papayas, bananas). I felt so spoiled! Spoiled, yes. Eager to wake up at dawn? Not so much. 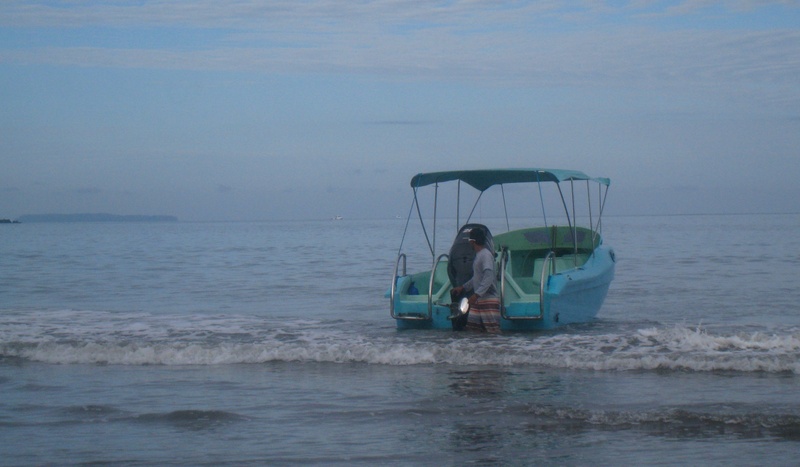 Since I’d arrived by plane, I hadn’t realized that there are no docks in the Peninsula de Osa – boats land on the beach, and the navigator has to get out and use the waves to bring the boat ashore (likewise to launch). That means getting in and out of the boat requires walking thigh-deep in water and crossing your fingers a big wave doesn’t roll in. But I’ve said before that I liked how rugged Bahìa Drake was, and I truly had fun wading to get on the boat, even at 6:30 a.m.! 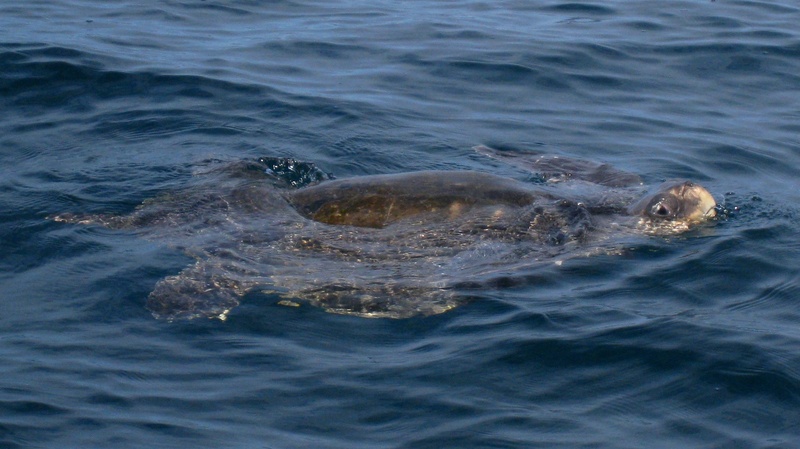 Not far out to sea, our driver spotted sea snakes (yuck), a devil ray and this sea turtle, which swam to us, waved hi (see above! ), then slowly dove down. Annnd we also saw dolphins! Two of them shot straight out of the water!!! Way cool (and very hard to snap). Though there are dolphin and whale tours in the area, it’s quite common to come upon pods of them en route to the island, as we did. With so many pairs of dolphins popping up around us, we stopped to marvel at their playfulness. There were at least 10 pairs! 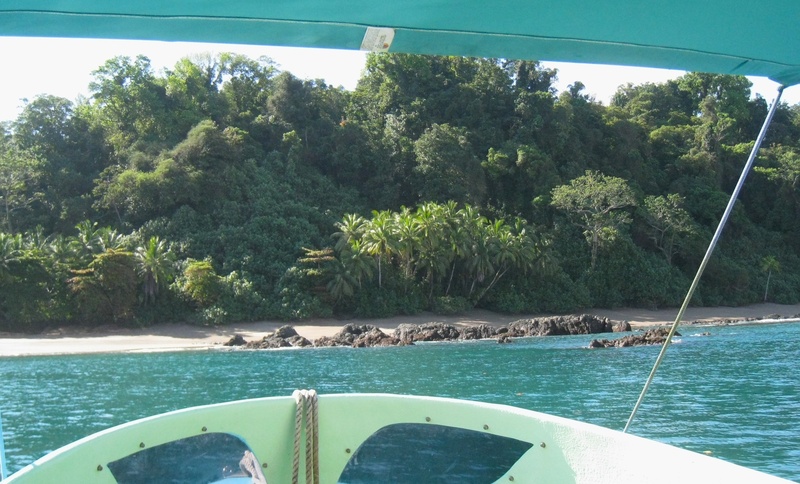 As we approached the island, it felt like we were actually approaching Jurassic Park! Filled with awe and excitement, I could even hear the theme music in my head. I know, I know, it’s cheesy but true. I half-expected dinosaurs to come out of the jungle to greet us! But, alas, we didn’t land and instead put on our gear (life jackets are required) to explore the reefs offshore. I said above that I’m scared of open water. Well, I’m also scared of touching anything in the water – reefs, seaweed, fish, anything! So when I looked down and saw three spotted eagle rays directly below me, I panicked. And when they appeared to be slowly flapping their way up toward me, I started kicking like mad, desperate to get away. Yeh, yeh, I realize the whole point of snorkelling is to see marine life – and I did want to see it – I just didn’t expect to actually be that close to it. Perplexed looks from my fellow snorkellers told me I was being foolish. And when one called out that a pair of white-tip sharks were heading my way, I really didn’t expect them to swim below me too, but they did! And that time I didn’t kick nearly as violently as with the rays. I even thrilled a little at seeing the sharks. A little. 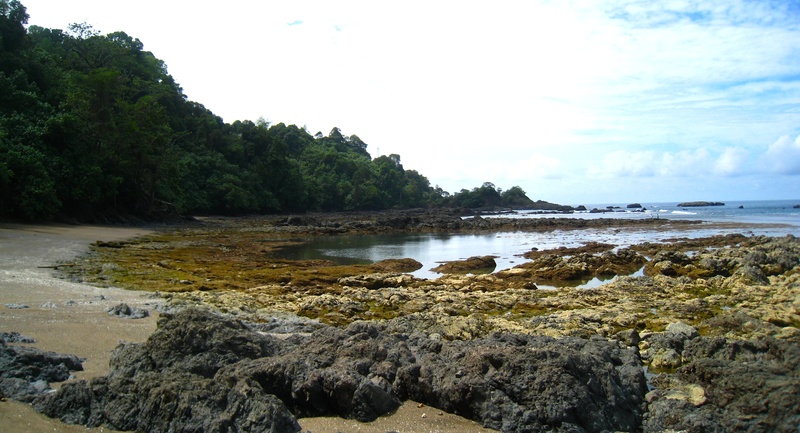 But it was enough to calm me down so I could explore the reefs more freely. 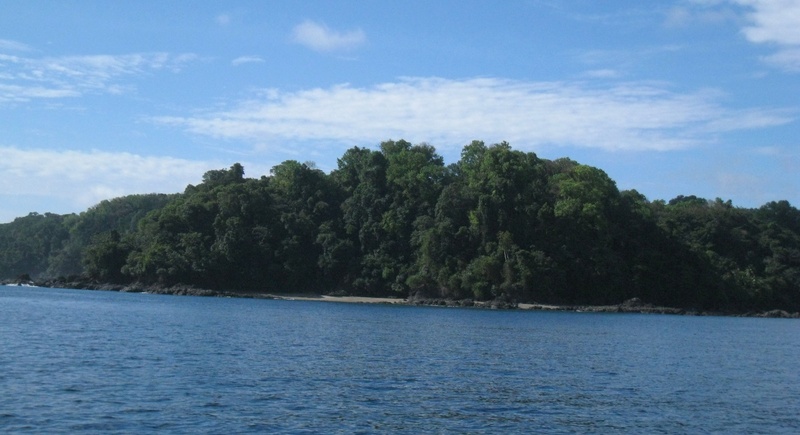 A while later, after swimming with lots and lots and LOTS of colourful tropical fish, we landed ashore and had an hour to explore or relax before regrouping to eat at picnic tables hidden among the trees. Remember, pretty beaches these are not. I quickly gave up on stretching out on my towel when noseeums began biting me. 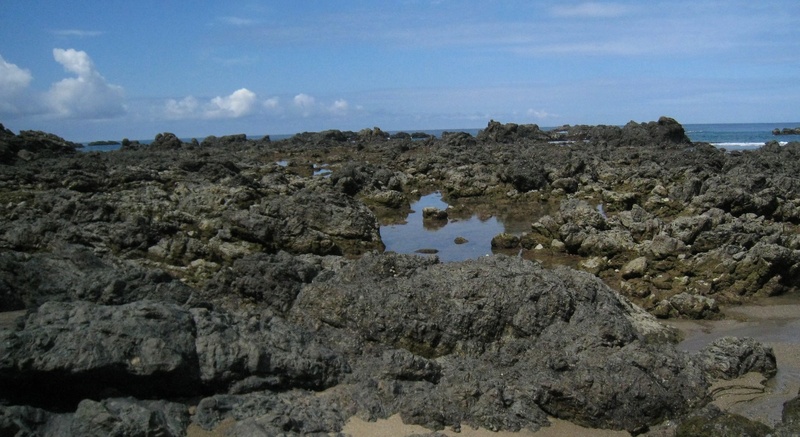 Siesta was not for me that day, so I wandered along the beach and discovered these creepy volcanic rocks. And on the other side of the outcrops was this stunning scene. There’s a reason why I keep using the word rugged. By the time I got back to the main beach, our guide had laid out a yummy spread of pineapple (I never, ever tired of fresh pineapple! ), pasta, sandwiches and salad. Hermit crabs scuttled about at our feet while we ate. Some wild animals chased each other in the bushes. It was a relaxing break between swims. The only disappointment of the day was that the afternoon swim was kinda a bust, as visibility was poor. 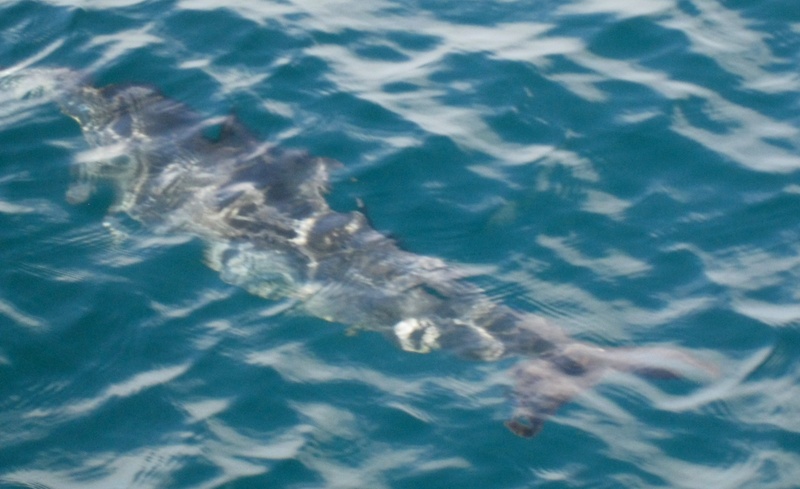 But I’d already had my adventure: my unexpected close encounters with sharks and rays! And dolphins! Seriously, I can’t get over the dolphins! Want to know just how fun – and bumpy – it was for me fly to Bahìa Drake? Read about it here. 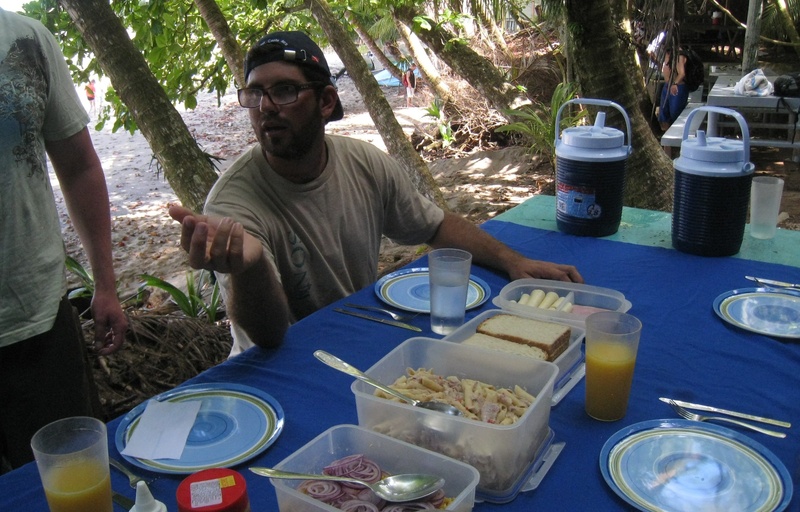 And then read why I miss Costa Rica so. 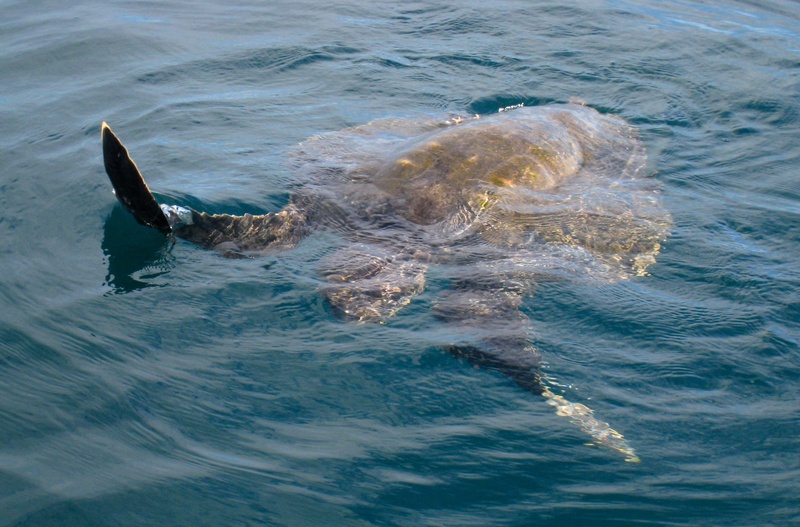 Awesome pictures, especially of the sea turtle! Thanks! I still can’t believe how the driver could spot such small creatures in the water when our boat was moving so fast!